AFSCME Local 3299 is currently on a three-day strike to fight low wages, and the unequal treatment of women and people of color working at the University of California. Thousands of working people across the UCs took to the streets to rise up against the exploitation and injustices inflicted onto them. In cities all over California, unions, community groups, and allies are standing together to send a clear message to the University of California: We will not tolerate the inequity and inequality burdening the service workers. We are standing together, we are fighting back, and we are holding the UC’s accountable. The service workers are not the only ones shedding light on the injustices of the UC system. Assembly Appropriations Committee Chair Lorena Gonzalez (D-San Diego) and two dozen other California Legislators have criticized the University of California for lobbying State lawmakers for an extra $140 million in taxpayer dollars, while failing to address the current concerns of UC service workers. The institution continues to deny workers’ their benefits by avoiding collective bargaining agreements, which has led to the exploitation of its lowest paid workers. The University has raised healthcare premiums, outsourced jobs, upped the retirement age, and has not replaced former employees, forcing UC workers to take more responsibility without any compensation. A recent report has ignited the need to demand equal pay for all and eliminate the wage gap for UC workers. According to the report, women and minorities earn less money than their white, male counterparts. The workers most affected by the wage gap are black women, who make the least out of all UC workers. This in an unacceptable and horrific discovery from an institution that prides itself in diversity and equality. In Berkeley, a large and vibrant crowd gathered on UC Berkeley’s campus to push back on the unfair treatment and discrimination placed upon working people and their families. Unions and workers alike joined today and rejected the University’s unfair agenda during a rally for equal rights, equal pay, and equal protections. 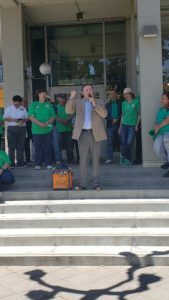 Among those rallying support for the workers was Kathryn Lybarger, President of AFSCME local 3299, and Art Pulaski, Executive Secretary-Treasurer of the California Labor Federation. The presence of AFSCME and its allies has been prominent, especially in Sacramento, where approximately 2,000 Californians gathered at UC Davis to protest the poor treatment. 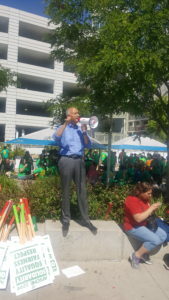 Elected officials, including state Senator Dr. Ed Hernandez, have come out on the frontline to support the workers and rebuke the structural inequality of the UCs. The California Nurses Association and UPTE-CWA have also pledged to strike alongside AFSCME for the next two days. With the influx of support, we’ve seen an increase of working people standing together in solidarity. Similar events are occurring in Los Angeles, where thousands have congregated at UCLA, San Francisco, San Diego, Orange County, Santa Rosa, and Santa Barbara. The UC’s failure to provide their workers with fair wages, proper benefits, and equality has led up to this statewide strike. Thousands of Californians have made it clear that they will not standby as the University of California continues to abuse and exploit their service workers.